Eh-oh! This is my webpage dedicated to the Teletubbies, still the best program on the telly! Click the links below to move around the site. What's happened since you were last here. Last updated 29/01/2004. This is what I put this site up for in the first place. Download some amateur teletubbies games for nothing! See, I really, REALLY love the teletubbies! This is on my hip, be warned. Yes, the Teletubbies' groovy hoover is online and waiting to chat to you right now! Cartoon starring Noo Noo and Laa Laa. Contains Flash and horrible jokes! The Purple One brings you a Flash thingy for making lots of tubbytastic NOISE! A Teletubbies themed wordsquare for you to print out and solve. Unfortunately some obscure country called Brazil fluked their way to the championship but back in spring, Teletubbyland had high hopes for World Cup glory. Miscellaneous snippets that don't fit anywhere else. 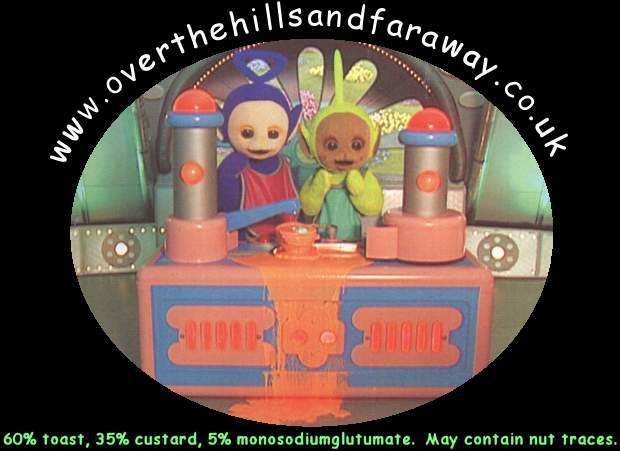 Simply the largest teletubbies links page on the web! Any questions or comments? You can reach me here. 179470 tubbie fans have been here since 15th May 1998.